The Victoria & Albert museum in London is full of curiosities. One of the most curious, of all of these curiosities, is the pair of Cast Courts; two really vast rooms that are chock full of plaster cast or electrotype reproductions of some of the worlds most fantastic sculptures and other 3D works of art. These faithful copies were mainly taken from works of art or architectural details throughout Europe during the nineteenth century, when the collecting of such casts was at its most popular. The Museum commissioned or bought these reproductions from some of the leading cast manufacturers of the day. The collection that was assembled allowed people who could not travel abroad to admire some of the major European monuments and works of art. They are still fantastic and an hour in the Cast Courts is a real education and one of the best things in London to do for free. For example, the Cast Court holds an electrotype of the gilt bronze plaque, Sacrifice of Isaac, the original by Filippo Brunelleschi (1377-1446) made in 1401-2. 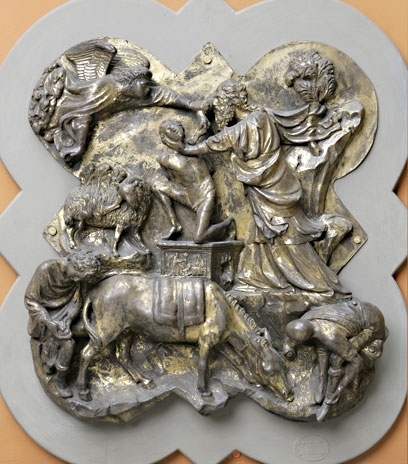 The plaque is 38.5 cm W x 41 cm H. This electrotype was made in about 1871 by Giovanni Ferdinando Franchi. 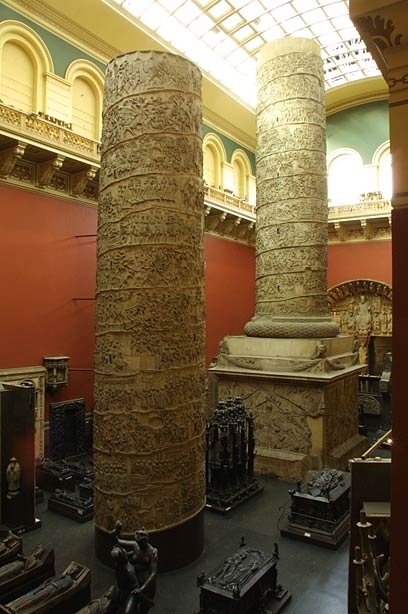 However, the masterpiece of the cast rooms collection is a two part cast of the entire height of Trajans Column (113AD) - which is about 35 metres high including the famous square pedastal. In some respects this cast has higher levels of detail then the slowly eroding original in Rome.